We just received the puzzles—they look great!! Thank you so much for all of your help!! Thanks, Guy! We received the puzzle today and it looks wonderful! We appreciate all your help. Letting you know that the Fotoforms came out fantastic. I was quite impressed with how much the technology has advanced since I last ordered these 25 years ago from other company! Thanks for your service and support. My 8x10 family fotoforms have arrived. They are perfect! So glad I went with the 8x10. Thanks so much for your advise, Guy! These will be great Christmas presents. 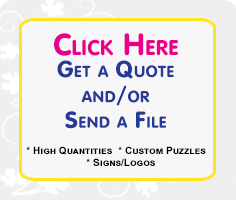 Are you a Photo Professional Looking to Offer the Very Best Photo Cutouts and Custom Photo Products to your Customers? Fotoforms is always looking for new dealers who believe that providing customers with superior products and value is the best way to build long term customer loyalty. Our dealers tell us their customers love our quality and they would not consider selling anything less. Here are some reviews from our existing clients and dealers. 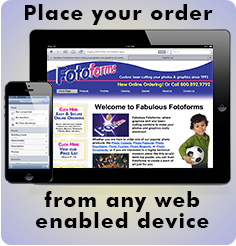 To qualify as a Fotoforms dealer you must be an existing professional photographer, lab, retail frame or gift shop, or have an established and related graphics business. Your business must have a website or Yellow Pages listing in the appropriate category. Sorry, dealerships are not available to the general public. Becoming a dealer is easy, just call us at 1-800-892-9792 or (612) 866-2282. Upload images and specify product one at a time. Best for sending lots of images, especially when all or most products are the same. For example, you shot a football team and each player ordered an 8x10 Cutout.